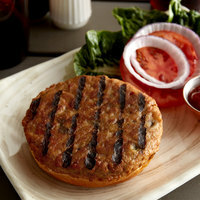 While beef patties may be the classic choice, other offerings such as turkey or soy burgers create variety perfect for health-conscious guests. These bulk burger patties can be prepared to you and your guest’s preference. Whether you’re grilling, broiling, or baking, each burger can be cooked to perfection to satisfy guests. Also make sure to check out other great items from Morningstar Farms, AdvancePierre Foods, Brakebush, Country Magic, Devault Foods, Farmland and Gardein. Burgers are a classic source of protein found in restaurants across the country. For your convenience, we offer these bulk burgers pre-portioned, which means you can simply season to taste and cook to perfection. Choose from a selection of blends to find the right balance of rich, juicy flavor. Keep your kitchen stocked on other delicious foods including pre-made soups, frozen entrees, and cheese. If you're wondering where to buy morningstar farms burgers, we have a large selection of morningstar farms burgers for sale at the lowest prices.